One of the many goals of the community and staff at Bosco Boys Home, Borivali is to provide children with quality education and give them the facilities needed to accomplish this goal. In an attempt to meet this goal, BBH tied hands with Bhumi. Bhumi is one of India’s largest independent and youth volunteer non-profit organisations. It was founded on August 15, 2006 by a small group of friends with a strong passion to change society today and build a better India for tomorrow. The organisation provides youngsters a platform to serve the society and bridges the gap between the educated and the uneducated. The volunteers educate and mentor children from orphanages, slum and village community centres across the country to give them a better future, which will benefit them as well as our country. 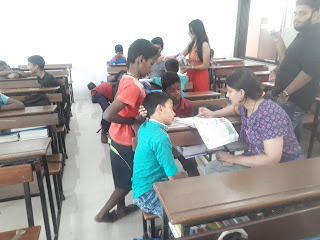 Keeping this in mind, BBH in collaboration with Bhumi organized study classes for the children with the help of volunteers for the subjects of English, Maths and Science. The teaching programme was arranged for the students from standard fifth to eight. There were about 6 volunteers. Each volunteer was assigned to a particular group whom they had to teach.